It will be seconds out at Stamford Bridge this evening as Valencia Amateur Boxing Club take on Chelsea in the Champions League quarter-final. The Spanish outfit will be boxing out of the white corner. 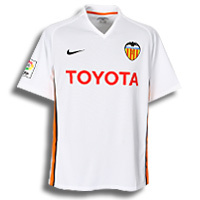 Their Nike-manufactured shirt is pretty basic with just the orange and black trim and red Toyota logo providing a bit of colour. Click here to buy it from Kitbag for Â£34.03.